Garage Door Services Indianapolis: Why Isn't My Garage Door Working? Why Isn’t My Garage Door Working? 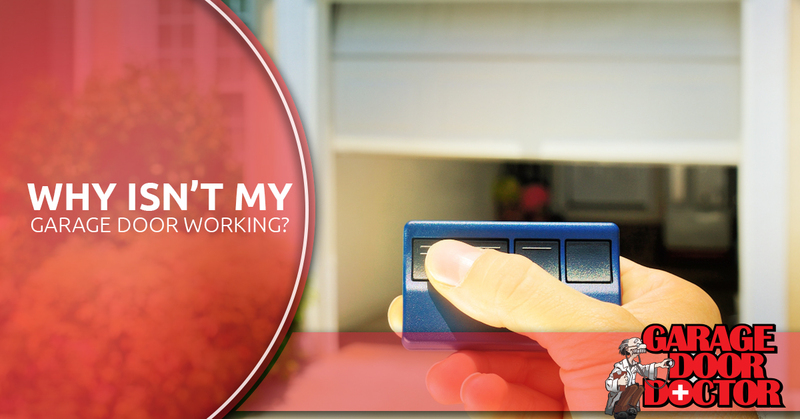 If you’ve ever had trouble with your garage door, you know how frustrating it can be to try and figure out what is wrong. With so many different moving parts, You may not even know where to start when it comes to finding the problem that has caused your garage door not to work. Luckily, the professionals at Garage Door Doctor know how to find and repair or replace any garage door problem. If you need help determining what’s wrong with your garage door, call us today to learn more about the garage door services we offer in Indianapolis and the surrounding areas. We’re also going to cover some of the most common reasons as to why your garage door may not be working in our post today, so keep reading! You may have been able to run and duck under your garage door as it was closing as a kid, but in 1993, garage doors began being installed with a photo eye on either side of the garage door which transmits a beam that is invisible between each other and works to detect anything in the path of the garage door as it’s closing. While this is an excellent safety feature to prevent a garage door from closing on something or someone, it can make it so your garage door won’t close if the photo eyes are not in alignment. To check the alignment, measure how far each eye is off the ground and ensure they’re at the same height, also check to make sure that they are pointing in exactly the same direction. You can also check to make sure the lenses aren’t too dirty, which can also cause the photo eyes to malfunction. Your garage door is a heavy piece of machinery, which can cause certain parts to wear down or break over time. Your garage door runs on a metal track, and it is important that this track stay in alignment, otherwise, it can become unsafe for your garage door to operate. When you hear a rubbing noise as the garage door passes certain spots, you’ll know that the door is misaligned. The door may even slow down as it passes certain points. In addition to these problems, when you see gaps between the garage door rollers and the rails, or if the rails are bent, you are likely going to be dealing with a problem. For a misaligned garage door track, it’s best to call a professional who will know how to safely repair the track. With so many different problems that can cause your garage door not to work, if you can’t spot an obvious problem with your garage door, don’t hesitate to call a professional who will know what to inspect and how to fix the problem. When you need a garage door professional, call Garage Door Doctor. We offer garage door services in Indianapolis and the surrounding areas.